Naren started studying classic cocktails at the tender age of, ahem, 15. Seriously, he did. Over a 25 year career in the hospitality industry, Naren’s skills have taken him around the world in various capacities: from training bartenders and consulting to tending bar at some of the world’s finest cocktail establishments in Sydney (most notably the iconic Bayswater Brasserie at the height of its success), as well as some of the most critically acclaimed bars in London and New York. Naren was once ‘The Cocktail Guy’ for the Avroko Hospitality Group in New York, creating and overseeing the cocktail programs at all five of their U.S properties. At the Tales of the Cocktail Spirited Awards in July of 2013, Saxon + Parole was crowned the ‘World’s Best Restaurant Bar’, under Naren’s guidance. It won the same award again in 2016. At those same awards held in July this year, Dante, the restaurant bar that Naren is currently in charge of, once again took home another big win in this same category. Naren is also a well respected and widely published food and drinks journalist who has been nominated four times as one of the top four drinks writers in the world at those same Tales of the Cocktail Awards, held every year in New Orleans. He is often quoted in the media as an authority on all things cocktail and spirit-related and he has made many appearances on television both in Australia and the US, presenting on Martha Stewart, Emeril Lagasse, the Food Network and NBC. He currently splits his time between New York and Paris and now spends much of the year traveling internationally, speaking at most of the world’s biggest bar shows, giving masterclasses to bar professionals and judging various global cocktail competitions. When he’s not on the road, you will find him regularly tending bar at his own establishment, Dante, which opened in 1915 in New York’s historic Greenwich Village. In its first year under the new ownership, Dante was ranked the #34 Best Bar in the World by Drinks International on their coveted and prestigious annual list. This year, they climbed to #16 on that list where they are also now placed as the fourth best bar in all of North America. In 2016, Dante was also a final four nominee in the Tales of the Cocktail Awards for Best New American Cocktail Bar, while Naren himself was also a finalist for American Bartender of the Year and Drinks Writer of the Year. 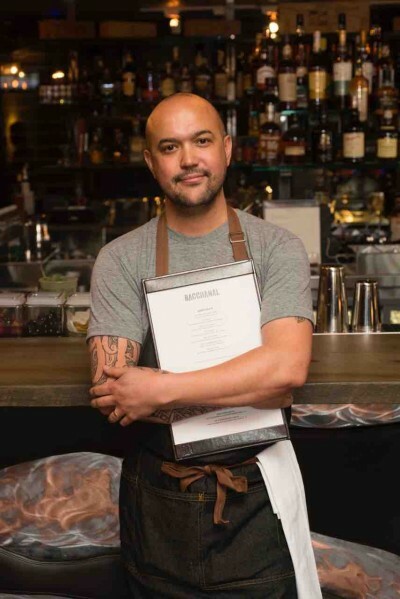 In 2017, Dante was awarded the Best Restaurant Bar in America at Tales of the cocktail, while in 2018, Time Out voted them Best Bar in New York and crowned their famous Garibaldi as the Best Cocktail in New York. For more on Naren, check out his rants on Twitter: @forkandshaker and his delicious Instagram account at that same handle.